The Steel Wheels are more than a string band; they’re a revival. The Americana quartet—from the Shenandoah Valley in Virginia—draw upon their shared Mennonite heritage to share old-time music sounds and a strong collective spirit. “It’s hard to divorce who you are and some of your background and know where that comes together and separates, but all four of us in the band do come from a Mennonite background, and one of the things they do very well is community,” says band frontman Trent Wagler. This sense of camaraderie has earned The Steel Wheels more than a strong following of their captivating mountain music. 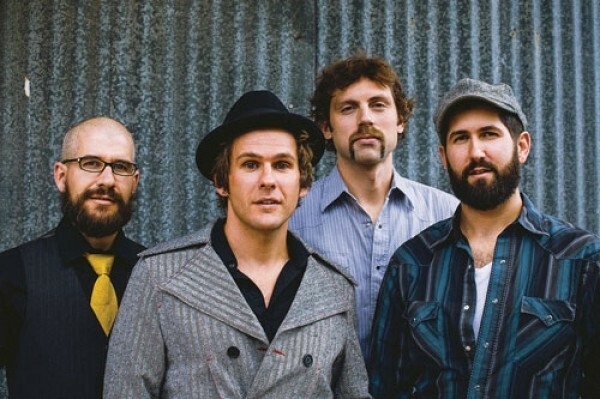 In 2013, they successfully launched the annual Red Wing Roots Music Festival, an idea that Wagler says stemmed from seeing so many great bands out on the road and at other festivals like the Ogden Music Festival, which The Steel Wheels are headlining this year. The Steel Wheels are often seen crowded around a single microphone during shows. Their strong sense of community also shows in their music, which focuses on the whole rather the individual. “We don’t spend a lot of time focusing on who is going to solo next or get a big moment,” Wagler says. “We approach it more about songs and arrangements that really communicate something. Their summer tour is based largely on their new single “We’ve Got a Fire”—released in April—an original song that was inspired by one of these musical heroes. Canadian songwriter Fred Eaglesmith—whom Wagler calls “a real troubadour”—gave the band “an unsolicited backstage inspirational speech” about the rebellious spirit of the great Johnny Cash, who never let anyone stop him from speaking his mind through his music. The Steel Wheels give new life to a sound that predates Cash’s style of old country and rock & roll; their Americana sound—old-time, Irish and blues—taps the roots of what American music has become. But the spirit of freedom and rebellion expressed in their neo-traditional brand of old-time music is still the same.